One factor: Those 65 through 74 are the fastest-growing segment of the population and older adults live in smaller households than younger adults. The rate at which Americans are creating new households has increased over the past year to reach the highest level since before the recession began in 2007. And it’s older Americans, not those ages 25 to 34, driving the uptick, according to new research from economist Jed Kolko of the Terner Center for Housing Innovation at the University of California, Berkeley. Americans created 1.27 million households during the year ended in June, Mr. Kolko estimates. That’s in line with Census Department figures showing year-over-year household formation topping 1 million for three straight quarters. A similar streak hasn’t occurred since 2006. 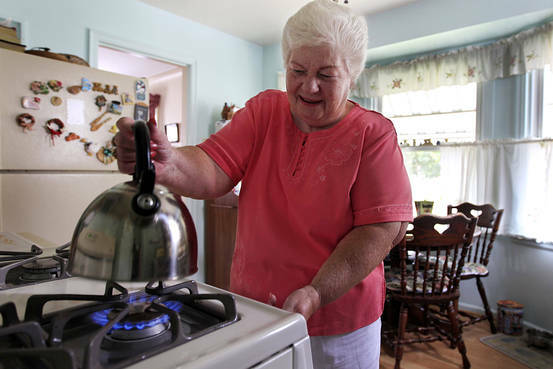 Of those new households, 860,000, or about two-thirds, were created by Americans between 65 and 74 years old. Just 159,000, or 13%, were created by young people between 25 and 34 years old. A household is formed when an adult leaves the home of another adult and finds his or her own place. The property could be owned or rented. Say, a recent college grad leaves behind roommates or mom and dad and rents her first apartment. 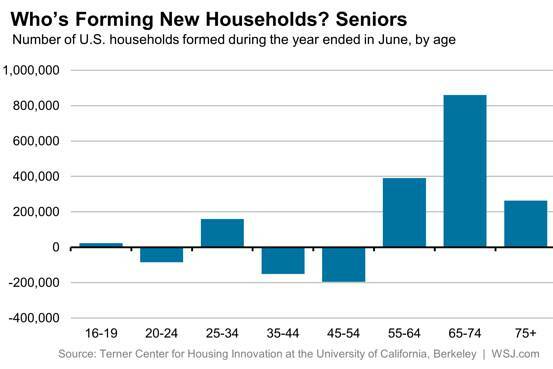 But baby boomers were the only age cohort where the share of adults that headed households significantly increased from a year earlier, according to Mr. Kolko. Why that’s happening is a bit difficult to pin down. One possibility is more older adults are getting divorced. Another factor is those 65 through 74 are the fastest-growing segment of the population and older adults live in smaller households than younger adults. “So population growth among older adults adds more households than population growth among younger adults,” Mr. Kolko wrote. The increased number of households among young adults entirely reflects population growth rather than a smaller share are no longer living with their parents, Mr. Kolko said. In fact, a separate report from Pew Research Center shows that a higher percentage of millennial adults are living with their parents than in 2010. This entry was posted on Friday, August 21st, 2015 at and is filed under News. You can follow any responses to this entry through the RSS 2.0 feed. Both comments and pings are currently closed.